I have had granny square earrings on my mind for quite some time now, and even bought some red and blue/green crochet thread from Hobby Lobby a while back when it was on sale, but it has taken me this long to put this together. Having one day a week to showcase a new jewelry DIY makes it much easier to get them done – sometimes I have trouble deciding which one to do! Anywho, you could work this pair of earrings in multiple colors, or just the solid color as I have done. I was going to make the first pair a bi-colored pair, but after working the first round, I thought there really wasn’t enough there to add a second strand of thread in – maybe you are more comfortable working with the thread? I haven’t done too much with thread yarn. 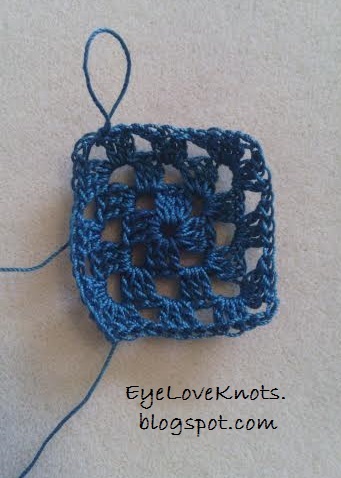 Shop EyeLoveKnots Etsy: Framed Granny Square Earrings. 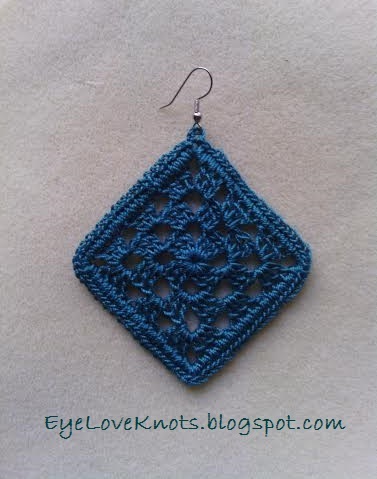 Shop EyeLoveKnots LoveCrochet: Framed Granny Square Earrings. Are you a Raveler? 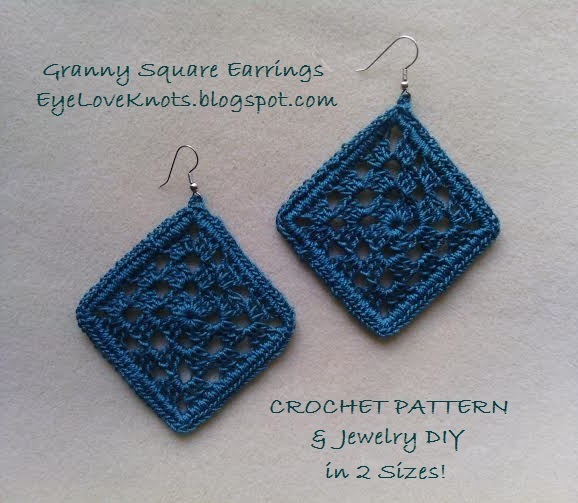 Share your version of this project on Ravelry – Framed Granny Square Earrings. I was able to work up the smaller pair in just over half an hour, and the larger pair in about an hour. The smaller square measures 1.75″ across square center, but dangles 2.5″, and the larger square measures 2.25″ across square center, but dangles 3.25″. 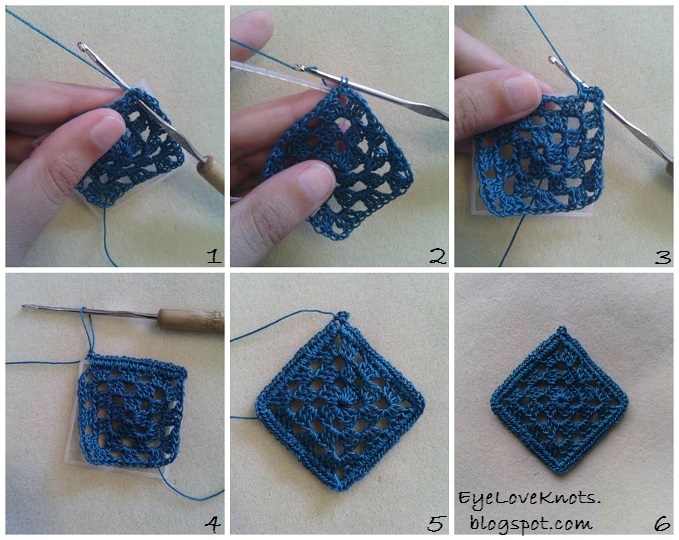 I have a photo tutorial on How to Work a Granny Square. Beginner friendly. In the pattern section, you’ll find two sizes. If work up the larger size, continue on to Round 3; if not, skip over Round 4 and proceed to the frame. 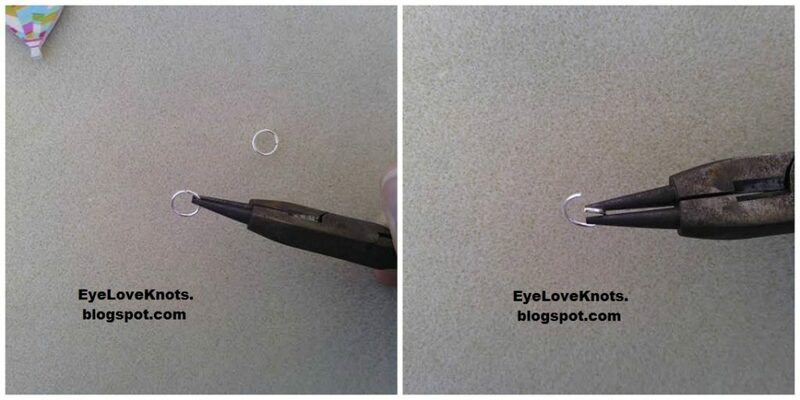 Grab one end of your earring wire with your round nose pliers. You will need to grab the other end with another pair of pliers or your fingers for leverage and stability. Pull open the loop TOWARDS you, not side to side. Close the same way. Chain 5. Join to form a ring. Chain 2 (doesn’t count as a stitch), (3 DC into the ring, chain 3) 3x, 3 DC into the ring, chain 2. Join to first DC. 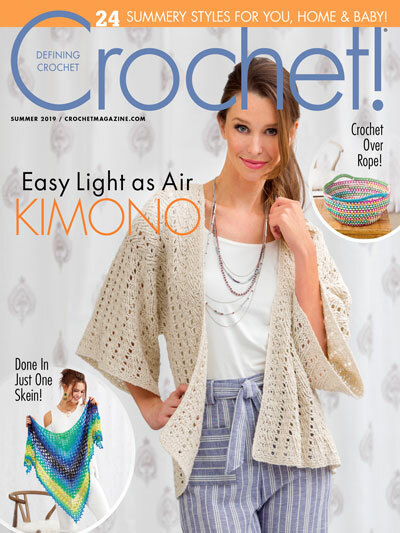 R2: Slip stitch over to the chain space. Chain 2 (counts as 1 stitch), 2 DC into the chain space, chain 3, 3 DC into the same chain space, chain 1, (3 DC in the next chain space, chain 3, 3 DC into the same chain space, chain 1) 3x. Join to the first DC. Loosely slip stitch over to the corner. R3: Slip stitch over to the chain space. Chain 2 (counts as 1 stitch), 2 DC into the chain space, chain 3, 3 DC into the same chain space, chain 1, 3 DC into the next chain space, chain 1, (3 DC in the next chain space, chain 3, 3 DC into the same chain space, chain 1, 3 DC into the next chain space, chain 1) 3x. Join to the first DC. Loosely slip stitch over to the corner. 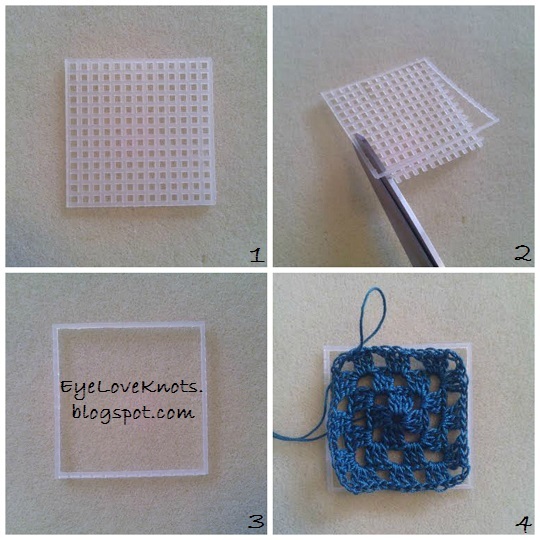 The reason I added the plastic canvas frame was because my finished granny square was not really laying flat, and since I am not a blocker, I thought of the frame so it would keep it’s shape and still be lightweight and flexible. Cut a 10 x 10 piece of plastic canvas out for the smaller square, and a 13 x 13 piece of plastic canvas out for the larger square; then cut all of the insides out so you are left with just the outer frame. This should be about the size of your granny square unstretched. Chain 1, 3 SC into the chain space, 2 SC into each stitch and chain space over to the next corner, (4 SC into the corner, 2 SC into each stitch and chain space over to the next corner) 3x, 1 SC into the beginning corner. Join to the first SC. Chain 1, 4 SC into the chain space, 2 SC into each stitch and chain space over to the next corner, (6 SC into the corner, 2 SC into each stitch and chain space over to the next corner) 3x, 2 SC into the beginning corner. Join to the first SC. Chain 3, slip stitch into the same stitch. Open loop of jump ring, and hook into loop. 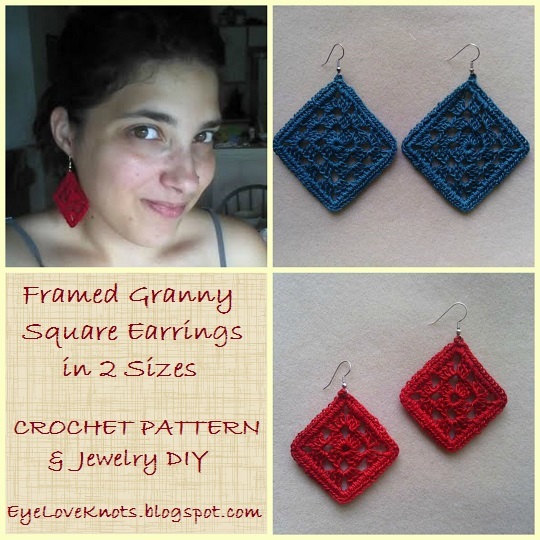 Please feel free to make and sell your own Granny Square Earrings using this pattern, but please DO NOT claim this pattern as your own nor should you sell my pattern, and DO NOT re-publish my photos as your own. DO NOT copy and paste my pattern anywhere, link to it instead. These are really cute. I made my first granny square the other night, but I'm nowhere ready to try earrings. Please share your finished earrings with me when you complete them! They look brilliant! I love your idea of using a canvas frame to stabilize them. Thank you! I am glad my plastic canvas was sitting out right next to me, otherwise I may not have thought of it. Beautiful earrings. Great idea to use a plastic framework. I don't know if I can buy it in my country, but I'll look for it. Thanks for your pattern and clear explanation. Brilliant idea for the frame! And this is a great way to wear large earrings that won’t stretch out your holes as they are light. Thanks so much for sharing on craft schooling Sunday! Thank you, Sara! Yes, I go for the light stuff because I don’t like it heavy on my ears. These you forget you are wearing them. These are adorable! 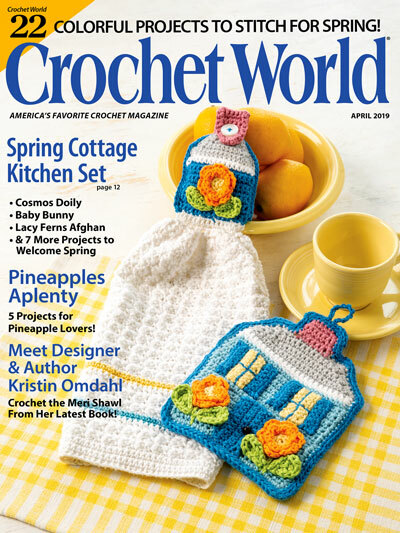 I have crocheted earrings before but never thought to frame them. How Creative! Im not a blocker either. In the past what I have done with earrings is spray them with a little spray starch, lay a damp washcloth over them and iron them. This makes them have just enough stiffness to keep their shape. I want to try it with the frame next time! You did a great job. Thanks for the tip. I love them. I don’t have pierced ears, but I have lots of friends who do and this would be a lovely handmade gift. You could always make some of these, and attach them to clip on findings! Thank you so much for joining the #weekdayWearLinkUp 🙂 Hope that you are having a good week so far 🙂 We finally got a break in the heatwave last night and it was so welcome! These are so cute. I love the red on you and the design. They look very stylish. Great idea. 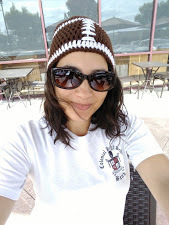 Thanks for joining in my Ginx Woolly Linx Party for February.